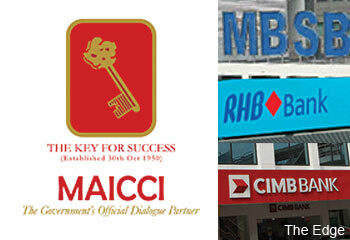 KUALA LUMPUR (Oct 3): The Malaysian Associated Indian Chambers of Commerce & Industry (MAICCI) has urged Prime Minister Datuk Seri Najib Razak to intervene and prevent the three-way mega merger between CIMB Group Holdings Bhd (CIMB), RHB Capital Bhd (RHBCap) and Malaysia Building Society Bhd (MBSB). In a statement today, the association has said it opposed the merger, citing among other reasons that the merger will not be beneficial to the Small and Medium Enterprises (SME)s.
"We are of the opinion that the proposed mergers of CIMB, RHB and MBSB is a step backward towards the development of the SMEs in the nation, due to the reluctance of the big financial institutions to support the growth of SMEs via requisite financing," read the statement. MAICCI also highlighted one of the contested issues of the mergers, where the Employees Provident Fund (EPF) as the substantial shareholder of all three financial institutions, intends to vote in the mergers by seeking exemption from the Bursa Malaysia listing rules. The association also raised concern over Bank Negara Malaysia's exclusivity clause which blocks others from placing competitive bids during the 90-day period, as this prevents alternative offer to the current merger proposals. According to MAICCI, the mergers would create another "banking conglomerate" which would worsen the already-lengthy processes and hurdles that SMEs face regularly, when seeking loans. The association also said the proposed merger would add on to negative perception of Malaysia as a foreign investment destination, following reports of some trepidation of foreign investors over the news of the proposal. Earlier this week, The Edge Financial Daily reported that the Abu Dhabi government has formally written to Najib, expressing concern over EPF voting in the mergers. Abu Dhabi's strategic investment arm, Aabar Investments PJSC, owns a 21.2% stake in RHBCap.